Touro Law Center third year, full-time student, Sina A. Nazmiyal, was selected as the recipient of the Hon. 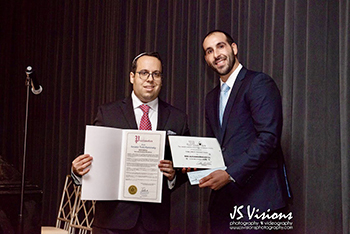 Jed Orenstein Memorial Scholarship from the Jewish Lawyers Association of Nassau County. He was awarded the scholarship at the bar association’s annual installation dinner. Mr. Nazmiyal applied for the scholarship based in part on his academic success and work with the immigration law clinic at Touro. His work in the clinic resulted in receiving guardianship and special immigrant juvenile status for several young teens that fled from other countries out of fear due to threats from violence and gang members. Mr. Nazmiyal, who resides in Great Neck, NY, is a member of the Jewish Lawyers Association of Nassau County and hopes to make a positive impact on Touro’s Jewish Law Students Association while contributing to the Law Center as a whole. Mr. Nazmiyal plans to work in either commercial real estate or the general liability field focusing on personal injury matters upon his graduation in May 2019.